It’s time for all those office housekeeping and year end review activities, and here is a list from us for your marketing. Reason: We got enough promotional product business to cover our costs and marketing plan clients to make it profitable. Reason: Hank has remained on the board of directors and as our ‘first chamber’ it always has a warm place in our hearts. Hank was also awarded as an honorary Lifetime Member in 2017. Reason: Though it was fun, it generated zero business. Didn’t even put us in front of a lot of people. This will not be repeated because though we were able to try out a few new teaching methods, that is not worth the time invested. Reason: Generated more business and leads than all other marketing tools. We have 6 (maybe 7) bootcamps on the calendar for 2018. Gives us the best opportunity to educate the widest audience on how they must market their business. Business (objective) plus the Feeling (subjective) are put together to come up with a grade. You should also grade each method based entirely on Dollars Generated. Are you placing ads in a local newspaper? Did you generate at least 4 times the dollars for each dollar spent? If not, give it a C. If it did, then a B or greater. In your year end review this is where you will look at your non-employee team. Is your accountant responsive? How fast does she answer your phone calls? Is your financial planner pro-active? Does he bring you financial ideas? Has he already looked at the tax bill and called to set a meeting? Is your auto lease and all your other leases (equipment) up soon? Is your web hosting agreement up to date? Is your credit card processor still giving you the rate they promised? Is their service worth the fees? What ARE all those fees? Is your office rental still serving you? Do you need to have a meeting with the building manager? 2017 taught us all that we need a plan in place to deal with weather issues. But your year end review is more than worrying about weather. Not everyone has to worry about hurricanes or earthquakes, excess snow, or a truck running into a power pole which can all leave our business unable to function in our normal space. You need a printed binder of ‘what ifs’ that is copied to your entire management staff. How will they check in? How will you continue to pay your bills? Can you literally write checks without a computer? There are a ton more questions we would ask here of clients, but you get the point: Walk through your office and ask a lot of WHAT IF THIS WERE NOT THERE? We have a plan to run our entire Small Business Marketing Plan bootcamp without power. It would be more challenging, but we can do it. This is also when you should review your Continuity Plan: how will your business function if your key employee is suddenly unable to work for any reason? * Are your sales funnels operating? Do you need to change the offers? Do you need to A/B test them? * Is your website up to date? Does it still reflect your image? We just decided to change our name (don’t do this twice in 15 months without professional assistance) to Yuloff Creative Marketing Solutions so we need to phase out the Sedona Marketing moniker we put into place just two years ago. This meant that we had to change the SedonaMarketing.com landing page and video. Here are photos of the layout prior to the change (or click so you can see the difference). Here is an important tip: We just added the CLICK HERE starburst on each button because we found that people did not know to Click Here. It was not obvious. We made it obvious. We will update our main sight next year, after fully launching The Small Business Marketing Plan, which, we decided in our year end review, would take priority. What in your business needs priority attention? * Have you done a recent internet search of you and your brand? Find any old phone numbers or addresses lurking on various websites? * Are your URLs about to expire? We caught 3 for two clients in one week which would have essentially put them out of business. * By the way, is all the information on your business card up to date? I had to send a box of our marketing books to someone running a silent auction and the address on his card was wrong. When it came back, wasting $40 in my shipping charges, he explained that he had changed it on his email signature but was just getting rid of the last few hundred business cards. His business is based on getting tiny details correct. I wonder what he misses when he is doing what he does. What if someone is sending him paperwork and has his card on their desk? What business is he losing? This part of your year end review does not mean to decide who stays and who goes, but getting input from your team. Get them into the constant mode of asking for feedback from your clients. * What learning moments can we share with everyone? * What are the three most important things we need to change in how we operate? * How can we improve our training? Train your staff to be open to gathering information. Prior to this meeting, you should have your business ‘secret shopped.’ We call clients all the time to see how the phone is answered and how our questions are answered. That is the first line of contact so it best be strong. You’re probably thinking that your “Year End Review” could easily be a “Year Long Review.” You are thinking correctly! The more we are open to improving, the more we are coachable, the better our business will be in the short and long term. Would you like help putting your year end review together? Have you done the review and need help with the ‘What Now’ part of the process? Is now the time to hire a marketing coach and hugely improve your sales and bottom line? Get in touch with us through social media. 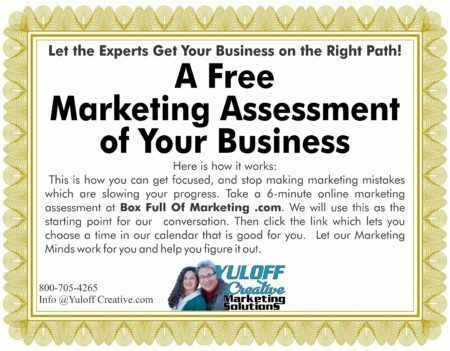 Or head to BoxFullOfMarketing.com and take the short assessment and then click the link to get into our calendar. We are here to help and look forward to serving you.